« What is the coolest animal you have seen? We had last started a discussion about lid disease. We see lots of patients here with a variety of lid maladies that affect its position, function and appearance. Some are genetic in origin, many are acquired problems, and most are succesfully treated. My last post talked about congenital lid changes. Let’s dip into some of the common acquired issues we see in the dog and cat. Entropion is rolling in of the lids and this presentation comes in two flavors, primary or spastic. With primary entropion, the lid isn’t built quite right with the lid rolling into the eye causing local irritation from hairs rubbing on the corneal or conjunctival surface. This is typically a surgical disease. Many breeds of dog are predisposed to this such as the hunting or large breed dogs. In cats, I see this most often in older cats for the big males with deepset eyes and large jowls. Sometimes this may be a “normally abnormal” finding such as in the Saint Bernard or Newfoundland where the lids are loose and rolling in a little but the dog shows minimal evidence of irritation. In these dogs, a minor mucoid discharge or surface redness from exposure is not uncommon and surgery is often not warranted. 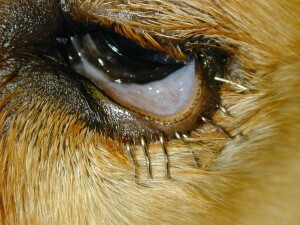 In other dogs, squinting and rubbing is obvious and the development of corneal ulceration is not uncommon. These will warrant surgical intervention. Entropion of the lower lid. Spastic entropion is a dynamic rolling in of the lid secondary to ulceration, lid swelling or some overt pain. 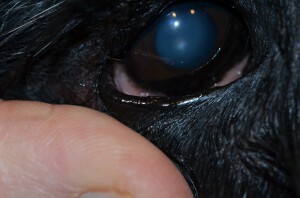 Dog’s and cats can retract their eyeball into the socket as a pain or protective response. When this occurs, the lids may have the tendency to roll in and aggravate the pain. The globe retracts farther, the lid rolls in more, they start to rub, the lid swells, rolls in more….you get the idea! If the pain response is removed or blunted, with topical anesthetic for instance, the lid may return to a normal position as the spastic component relaxes. In this patient, we need to palliate the entropion while the irritation is resolved and hopefully the lid will remain in a normal place at the conclusion. I see this a lot with Bulldogs that have skin allergies where their face swells, for example. Some cases are a variation on this catergorization as a primary component is worsened by a spastic component. A good example would be the Shar Pei puppy with entropion that is not developed enough to determine if the lids will remain rolled in as they grow. 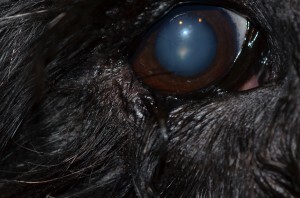 This case may be treated like a spastic entropion initially and then need surgery later once the dog matures. 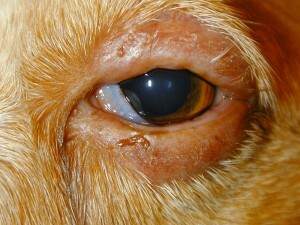 Or the allergic dog with entropion that has made the eye look worse than it is due to inflammation or self trauma. One needs to resolve this features before surgery as overcorrection can ensue. Repair of primary entropion entails removing skin to evert, shorter or loosen the lid margin. There are many techniques to accomplish this goal. Which technique is employed depends on the features that contribute to the abnormality. The “basic” repair involves removing skin in an ellptical shape away from the lid marging with a width that approximates the amount of roll. 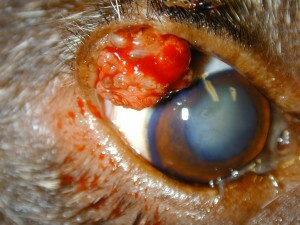 The wound is then closed to pull the lid margin away from the cornea. Over correction or under correction are the biggest risks. 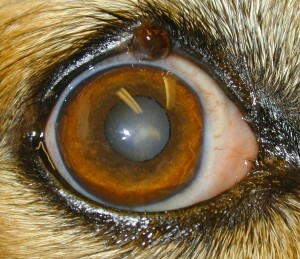 Lower lid entropion in a large dog. Note discharge and hair on cornea. Using my thumb to roll out lid and expose lid margin. Temporary tacking is the term used to palliate a spastic entropion. Suture or staples can be used to gather the skin and evert the lid without actually removing the skin. Once the irritation is resolved, these are removed to assess the true lid position without the active spastic component. Some may need primary repair after this procedure where others with complete spastic entropion will be fine unless another episode of pain occurs. This procedure is also used in young puppies, like the Shar Pei, to allow them time to “grow into” their lids before determining if primary repair is needed. Stapling lower lid for a spastic entropion. Lid tumor development is very common in our patients. Fortunately, 95% of lid tumors are benign. They typically arise from the meibomian glands or the lid skin itself. Ease of removal is proportional to size. If a tumor is less than 1/3 of the total lid length, simple excision can be performed. If it is greater than this, cryosurgery or removal with lid reconstruction may be needed. Many tumors remain small and don’t enlarge significantly over time. Thus, if a mass is noted and it is irritating or obviously enlarging then it will be much easier to remove if it is small. If it is stable then waiting and watching or removing if another anesthetic event is needed would be prudent advice. Many general practitiioners are comfortable removing smaller masses. Larger ones should be addressed by a specialist who may have different options and approaches to maintain good lid function. Large lid tumor that warrants surgery. Inflammation or infection of the lid is called blepharitis. The lid is just fancy skin with a function to protect the eye and thus reacts like skin anywhere to allergy, trauma, immune-disease, etc., by becoming red and swollen. 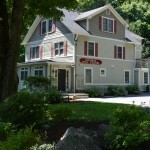 Organisms, primarily bacteria, can be the source or result of these issues. Similar to skin, oral medications are often used for a number of weeks to try and reverse the problem. Unlike skin, topical medications are typically not used due to ocular irritation to the products in the lotions or salves. Topical eye drops don’t necessarily penetrate well into the lid and may be ineffective. This photo shows a lid with bacterial blepharitis that responded well to oral antibiotics and antiinflammatories. The dreaded Elizabethan collar is oftern needed in these cases as self trauma is usually evident as noted by the concurrent hair loss. Blepharitis with moderate swelling and hairloss. These are just a few of the many problems that can be seen in the lids of our patients. If you notice these changes, give us or your veterinarian a call as most times early intervention is best!